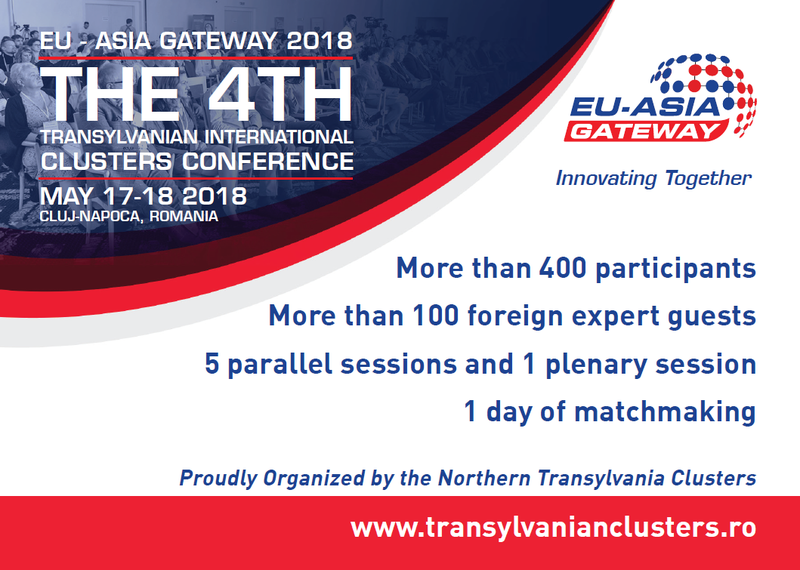 "Transylvanian International Clusters Conference” is an annual event that resulted from the necessity of creating joint innovative projects, with a major impact on the community, but also on the industries that the member entities are part of. The conference is at its fourth edition and will reunite more than 400 participants from Romania, European Union and abroad. The event aims to bring together partners from EU and Asia with a view to contributing to the development of economic, academic, cultural and institutional relations in the context of preparing Romania for the presidency of the Council of the European Union. Thus, the framework for the event deployment are strategic partnerships between representative structures and regions of the two continents. In the afore mentioned context, the Northern Transylvania Clusters Consortium, a relevant association of clusters in Romania (for the projects generated and the support provided to the economic environment), aims to promote cross-continental collaboration models for adressing global challenges. The conference presentations will make reference to the Open Innovation 2.0 concepts, where, citizens will be involved as well, along with actors from the knowledge triangle (companies, universities and public administration). The conference will be proceeded on the 16th of May by an welcome reception and dinner offered by the Municipality of Cluj-Napoca. The event's agenda includes welcome messages, starting on the morning of the 17th of May, from organizers, local and regional authorities, as well as from the representative of the Romanian Government under the patronage of which the event takes place. The plenary sections shall bring input from the European Commission, the Committee of the Regions, Romania's Representative Body of Clusters - CLUSTERO and also from governmental and business support structures from Asia. The parallel sections of the event will place a special focus on topics of global importance such as: “Challenging industries. Trans-continental approach”, “Digital Innovation Hub - Support for Industry Transformation”, “Towards Sustainable Agribusiness Systems”, “Locked in Technology” and “Challenges addressing energy poverty”. The speakers and the audience invited are personalities, collaborators and representatives/members from the clusters ecosystems. For adding value to the conference there will be also a matchmaking event organised on the 18th of May, where clusters, companies and other participating entities from all over Europe and Asia will be invited, in order to discuss future innovation cooperation projects. The participants have the possibility of creating a personal profile on the B2Match platform (the added value being the opportunity to find business partners or projects they wish to invest in): https://ue---asia-gateway-2018.b2match.io/. Those who are interested may register until 14th of May 2017. For more information, please visit the official website: http://transylvanianclusters.ro.